Posts related to the rates or premiums charged by health insurance companies for their health plans. Covered California takes a dig at the federal government correctly pointing out that rate increases, because of the removal of the individual mandate, means the subsidy amounts for consumers in Covered California will increase, “…the federal government will end up paying an estimated $250 million more in higher tax credits.” The loss of consumers will also impact Covered California. They estimate that enrollment in Covered California could decrease by as much as 162,000 individuals. Covered California is funded by a health plan fee for every member who enrolls through Covered California. In their conclusion, Covered California notes that health plans have already begun their decision-making process for participation and rates for 2019. The decisions the health insurance companies make will be based on existing federal rules. If the rules and policies to stabilize the marketplace are not implemented in the next couple of months, consumers will most likely face premium increases of 12% to 32% in 2019. 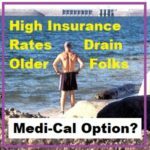 Should Older Individuals Go Medi-Cal To Beat High Cost Of Health Insurance? Finally, some folks are considering just enrolling in Medi-Cal because they are eligible. They have very little or no income to report on their taxes because they are living off of savings, interest, and dividends. Here again, Medi-Cal would be used as a containment strategy to an unexpected accident or illness. Medi-Cal is typically a HMO plan which requires a Primary Care Physician to make referrals to specialists, order tests, or imaging.